If Ethington Theatre at Grand Canyon University ever staged “Goldilocks and the Three Bears,” freshman Heidi Laabs would make an ideal lead character. 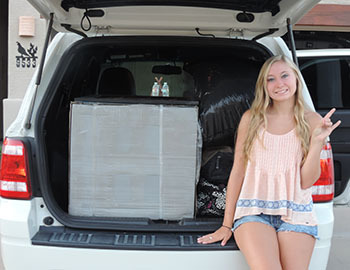 The Mesa biology major, who moved into Willow Hall with hundreds of other new students Tuesday, has sampled University life over the past 72 hours and is finding things to her liking. It’s been a blessed week filled with good fortune. Her room, a vintage Pottery Barn prototype, is clean and cool. Already, her roommate and suitemates have BFF status, and in just three short days on campus, Heidi has experienced some of the best things GCU has to offer — a warm welcome from volunteers, a high-energy worship service, movie night, swimming, free iced tea and much more. All with thousands of other members of the Class of 2019. With her long blond hair, Heidi is more Goldilocks than Little Red Riding Hood or Snow White. The only child of Susan and Tom Laabs, Heidi graduated from Gilbert Christian High, a college preparatory school, with about 40 other seniors this spring. She likes science, played on the women’s basketball team and performed with the hand bell choir at her church, Christ’s Greenfield Lutheran in Gilbert. Heidi is a biology major with an emphasis in pre-medicine who plans to become an eye doctor. She started thinking about college as a sophomore in high school and touring campuses with her parents as a junior. There were three: the University of Arizona was too large, Concordia University Irvine was too far, and GCU, with its new science programs and buildings, interesting cadaver lab and friendly vibe, was just right. Earlier this month, Susan and Tom took their daughter to Hawaii to celebrate her graduation, and by the time they returned, Move-In was less than a week away. 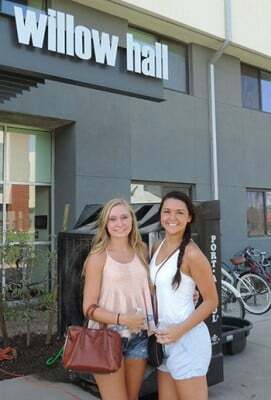 Many of those remaining days were spent on multiple shopping trips to get everything Heidi would need for dorm life, and there were teary times, especially at a going-away party Heidi threw for her best friend, Hayley Normoyle, on Saturday night. Hayley is attending Vanguard University in Costa Mesa, Calif.
Heidi leaves her family home in Gilbert for GCU Tuesday morning. 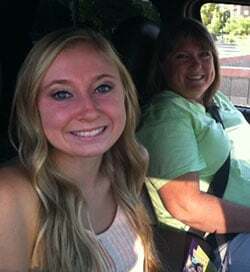 Heidi and her parents had a brief night of sleep Monday before caravanning to GCU at 6:30 a.m. Tuesday in her car and theirs, radios tuned to the family’s favorite genre of music, country. As they weaved their way through campus, Tom marveled at the cheering volunteers, mostly returning students, who lined the campus roads. Once at Willow, the Laabs’ cars were quickly unloaded of Heidi’s things — suitcases, boxes of food and a mini-refrigerator, among other necessities. Susan thought less than an hour had passed from the time they exited I-17 at Camelback Road and were directed to the GCU parking garage. The afternoon was spent setting up Heidi’s new suite with roommate Peyton Faber and her family from Prior Lake, Minn. The girls were delighted to learn their decorating tastes and preferred colors were complementary. Susan, who’s had “good days and bad days” in the weeks leading to her daughter’s departure, said she felt soothed by volunteers who “remembered to cheer on the moms after their students were dropped off,” she said. 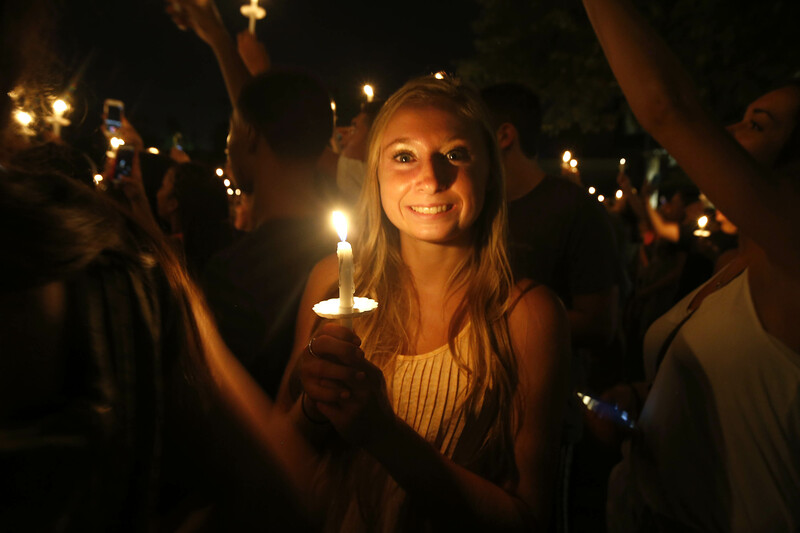 Later that evening, along with nearly 3,000 other GCU students, Heidi and Peyton attended a worship service, their first, in the Arena and the candlelit commissioning of their new class right after on the Quad. “It’s really cool that we all came together like this,” Heidi said, looking around at the hundreds of candles and classmates clustered about her. Heidi fell asleep the second her head hit the pillow on her new bunk bed. The day had been too long, the time with her parents had been too short, but Tuesday night’s sleep — nearly 12 hours — was just right. Heidi spent part of Wednesday with Hayley, who dropped by GCU before heading off to California. Heidi and her new friends learned the Arena was hosting movie night for students, so they donned their pajamas and walked over. Heidi and her mom, Susan, waited less than an hour to be moved in at Willow Hall Tuesday. Thursday was a day to cool down with iced tea and Jamba Juice and get tickets for the free Phillip Phillips concert in the Arena Saturday night. Susan and Tom drove over from Mesa to take their freshman to dinner later that afternoon. Heidi had the foresight Thursday to find the best route from Willow to the College of Science, Engineering and Technology’s new building across campus. Doing so will help her minimize possible snafus when classes start Monday and the sidewalks are filled with students. The new building is a modern facility with classrooms, labs, equipment and lots of new chairs. We imagine Heidi will find one that’s just right.